What a week, there were a few headlines in the Big 12 this week. 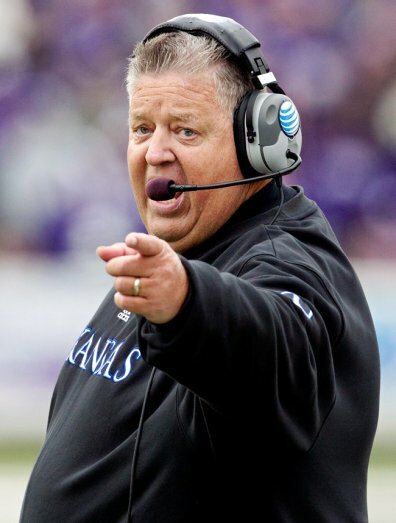 First of all, Charlie Weis, the former Notre Dame coach, and Offensive Coordinator under Bill Belichick for the New England Patriots and Will Muschamp at Florida, was fired by the University of Kansas on Sunday. The reason cited by Kansas AD Sheanon Zenger was a lack of on-field progress with only 6 wins in the Weis era. What?! We’re talking about a school where the football field still has a track around it. Weis brought in a new recruiting plan and got the Jayhawks playing better on the field. The only real problem was that the rest of the conference made more progress faster because they had better athletes from before Weis arrived in Lawrence. However, I did call a shot once the Weis firing went public. Daxx Garman finally lived up to the on-campus hype at Oklahoma State coined “Garmania” by the O’Colly’s Nathan Ruiz (at least that’s what he tells me). A guy I sat with at the UTSA game pointed out that he was essentially JW Walsh without the speed. After watching the rest of that game, I admit that I agreed. Thursday night against Texas Tech, Daxx Garman looked like he was the opening day starter. Garman picked apart the Red Raider defense even though he threw his first INT of the season. Davis Webb actually ran the ball against the Cowboys, which caught me extremely off guard. I didn’t think Webb would ever even try to be a mobile QB. The Red Raiders’ defense was quite surprising, in a positive way. I really hope that they can keep it up. Baylor dominated in Ames, Texas blanked Kansas, and K-State handled UTEP. No. 7 Baylor over Texas – The Bears are too high powered for Texas this year. Even in Austin, I feel like this is just a year for Charlie Strong’s team to just grow up and adjust to Strong. No. 21 Oklahoma State over Iowa State – With Daxx Garman rolling now, I don’t feel like the Cyclones stand a chance in Stillwater. West Virginia over Kansas – With the sudden turmoil in Lawrence, I don’t think the Jayhawks have any chance at topping Dana Holgerson’s Mountaineers in Clint Bowen’s head coaching debut. No. 23 Kansas State over Texas Tech – In Manhattan, I think this will be a close game and K-State will pull it out late. In Stillwater last week, it looked like the change at Defensive Coordinator did Texas Tech a lot of favors, possibly leading to an upset of the Wildcats. The biggest thing for me here is that Davis Webb is more than likely out, being listed as day-to-day and a gametime decision. No. 4 Oklahoma over No. 25 TCU – Bob Stoops and the Sooners go to Fort Worth. The athleticism contest between the OU offense and the Horned Frogs’ defense belongs to the Sooner offense. I expect this to be a shoot-out with Oklahoma on top.